January 11, 2019 marked yet another shameful anniversary of the opening of the military prison camp at Guantánamo Bay, Camp. This camp has come to symbolize the policies of torture and indefinite detention that became hallmarks of the US “War on Terror.” Today, 40 men remain at this prison. This includes 26 “forever prisoners,” people caught in a Kafkaesque nightmare where the US government claims it has no evidence to charge them with any crimes, but maintains they are too dangerous to release. In spite of the fact that it is well past time to close Guantánamo, on January 22, 2019 four members of the Senate–Tom Cotton (R-AR), Ted Cruz (R-TX), Marco Rubio (R-FL), and John Corryn (R-TX)–wrote to Donald Trump asking him to transfer over 700 alleged ISIS fighters to the prison. While this suggestion is abhorrent on a number of levels, it was without any legal basis. The main legal rationale for the continued operations of a prison camp is the 2001 Authorization for the Use of Military Force (AUMF). The Bush administration argued–and the courts and Congress largely accepted–that inherent to an authorization of military force is a power to detain those captured on the battlefield. While the existence of Guantánamo has always strained and perverted that reasoning, and while legal reasoning is often used to justify already existing human rights abuses, the AUMF remains the legal lynchpin for detention at Guantánamo. An AUMF designed to target those responsible for 9/11 cannot possibly be said to apply to ISIS fighters captured in Syria, as they have no plausible nexus to the 9/11 terror attacks. The Trump administration, like the Obama administration, has argued that the AUMF allows them to target ISIS. This is all the more reason that Congress must reassert its constitutional war powers by repealing an AUMF that has become a blank check for war. Defending Rights & Dissent strongly opposes any efforts to expand the military prison at Guantánamo. 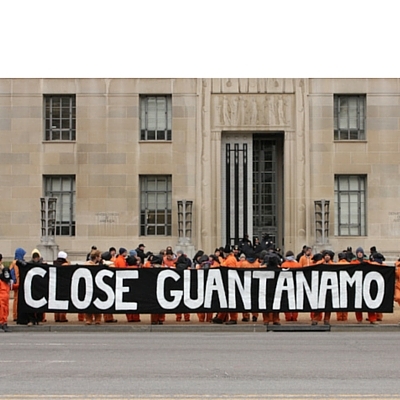 We reiterate our call for the military prison to be closed, for the AUMF to be repealed, and for the policy of indefinite detention to be rejected. Letter from progressive and civil liberties, including Defending Rights & Dissent, urging the Senate Democratic Caucus to oppose Trump's "war cabinet," i.e John Bolton, Gina Haspel, and Mike Pompeo.